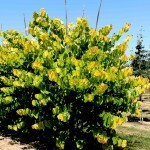 A compact small tree with golden yellow, heart shaped leaves. The new growth is blushed with copper. 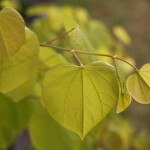 In shaded locations, the leaves turn chartreuse green. It has clusters of lavender-pink blooms before the leaves emerge in the early spring. It takes full sun to part shade and moist, well-drained soil. It will grow best with constant summer moisture and some shade in the hottest months of summer. PP 17,740.